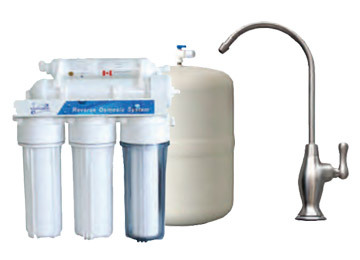 Adrian's Plumbing is pleased to feature a full line of reverse osmosis water filtration systems, with services including everything from new system installations to maintenance and repairs. Pure water drinking water systems from Excalibur feature reverse osmosis membrane technology, to provide you with water as it was intended to be, just H2O. Harmful chemicals are removed. Everyone will taste the difference Excalibur reverse osmosis systems make. Start now with an Excalibur Reverse Osmosis system and receive refreshing water, crystal clear ice cubes and better tasting coffee, tea and fruit drinks. Excalibur drinking water systems feature high quality membrane technology that produces purified drinking water. These Reverse Osmosis systems remove 10% to 20% more contaminants than most systems. High quality, pure, and great tasting water with high capacity from Excalibur Water Systems ... whenever you want it. Begin your day risk-free with pure water and a healthy diet. Because everyone deserves pure drinking water! For more information regarding the Excalibur line of Reverse Osmosis Systems, please visit the Excalibur Website.